Mon., Oct. 23, 2017, 7:16 p.m.
GAINESVILLE, Fla. – Florida coach Jim McElwain can handle the heat, the hate and even the harassment. He gets paid to deal with it. But he would like his players, coaches and all their families, including his own, to be left alone. McElwain said Monday that Florida players and families have received death threats amid the team’s struggles. McElwain acknowledged the allegation while responding to a question about whether the team deserves credit for staying competitive despite missing more than 20 scholarship players because of injuries and suspensions. “Credit in this business is internal; it’s never external,” McElwain said. “It’s a good lesson for the way things are. There’s a lot of hate in this world and a lot of anger and yet (there’s) freedom to show it. The hard part is obviously when the threats against your own players, death threats to your families, the ill will that’s brought upon out there. 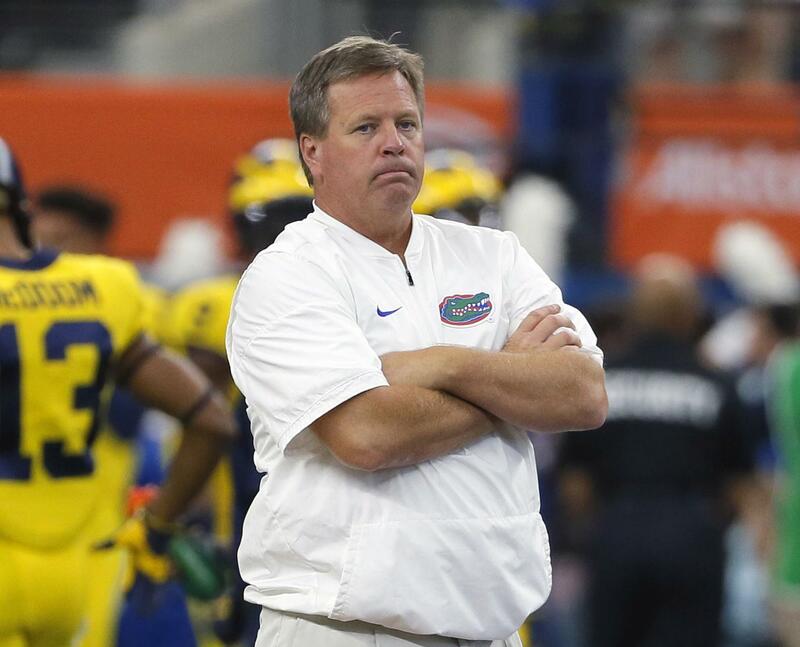 McElwain declined to say whether he personally received death threats. He added that he has not contacted police. McElwain is 22-11 in three seasons in Gainesville. The Gators (3-3, 3-2 Southeastern Conference) have lost two in a row as they prepare to play third-ranked Georgia (7-0, 4-0) in nearby Jacksonville on Saturday. Florida opened as a 14 1/2-point underdog. The Gators rank 102nd in the nation in total offense, showing little progress from McElwain’s first two years. Despite the injuries and suspensions, there is cause for criticism, and McElwain has acknowledged the team’s shortcomings. It also should be no surprise that someone would take it too far in an era in which coaches, players and families are easily accessible via social media. McElwain said the threats don’t surprise him. Players said all the negativity is impossible to ignore. Added safety Chauncey Gardner: “What’s the point of us paying attention to someone threatening one of our family members? I mean, he didn’t put his hands on him or his wife’s, so were not really focused on anything they have to say or what their opinion is. Published: Oct. 23, 2017, 7:16 p.m.